“From the early 11th to late 15th century, Dijon was home to the Dukes of Burgundy who were great patrons of the art. As a result, Dijon flourished into a cultural centre, attracting the Flanders greats as you can tell by visiting the Musee des Beaux-Arts. From Gothic to Renaissance, Dijon’s architecture such as the half-timbered houses which dates back to the 12th century, can be found in the city centre as it was spared during times of war. 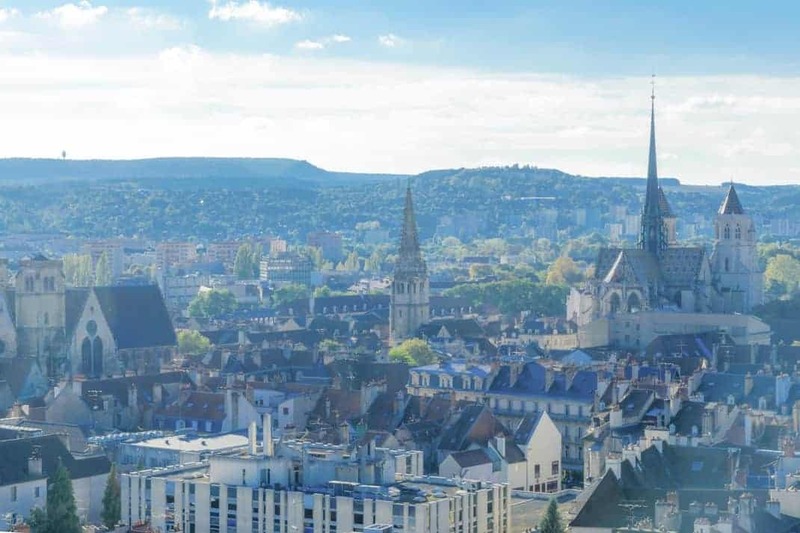 Dijon’s centre is so historical that it became a UNESCO World Heritage site in 2015. Being in the world-famous wine region of Burgundy, Dijon is on the route des Grand Crus and notable vineyards such as the Vosne-Romanee and Gevrey-Chambertin are reachable within 20 minutes from the city center. Gustave Eiffel, the man behind Paris’ star monument designed Dijon’s food market. The masterpiece of glass and steel is testimony to Dijon’s gastronomic influence. Every fall, the International Gastronomic Fair is held in Dijon. Attracting more than 200, 000 visitors, it is one of the most important fairs held in France. Florissimo, an international flower show is also a highlight of Dijon that happens every 3 years. The busiest months for travel is in July, followed by August and May. Summers are a bit wet as it is likely to rain. Wine harvests happens in Fall and you’d be able to attend the International Gastronomic Fair! If you want to avoid peak travel time, go in August. Dijon is a historic town with a lot to see and known for it’s gastronomy, eating should definitely be on the agenda. A day would suffix but if you’re going for a fair or visiting other neighbouring wine towns, two days and a night is advisable. Dijon is a larger city compared to Mâcon and Beaune and it can also be an alternative to shopping in Paris. Dressings is more casual compared to Paris but it’s equally chic. Dijon is also a bike-friendly city so if you’re planning on cycling around, do dress comfortably. Musee des Beaux-Arts is a fine arts museum housed in the Palace of the Dukes of Burgundy which used to be a royal residence. Founded in 1787, it is one of the oldest museums in France. You’d find oeuvres from Monet, Matisse, Manet, Rodin to Egyptian art. The museum is free for all to enjoy with guided tours and audio guides available at a fee. For some nature appreciation in the city and discovery, visit the Jardin des Sciences — a natural history museum, planetarium and botanical garden (Jardin botanique de l’Arquebuse). Permanent and temporary exhibitions are held at the planetarium. The garden consist of over 4,000 plant species, an arboretum and a park. Also, it’s walking distance from another garden, Jardin Darcy. Built between 1220 and 1240, the Eglise Notre Dame is an architectural marvel with its leering gargoyles and its 14th century jacquemart (bell-striking automon) which chimes every quarter-hour. Legend has it that one of the stone sculptures, an owl (la chouette) is a good-luck charm. Touch it with your left hand and make a wish! Dijon is 1 hour 45 mins from Paris and Lyon. From Paris, take the TGV from Gare de Lyon. There are also regular train services available from other European destinations like Italy and Switzerland. Buses are a cheaper option and will take about 4-hours. Tickets are available online. From Paris Charles de Gaulle Airport, it’s a 2-hour TGV train ride to Dijon. From Dole-Jura airport which serves low-cost carrier Ryanair, it’s 30-minutes by train and 20-minutes by taxi to Dijon. As for Lyon St-Exupéry, train which will take 3 to 5 hours with some transfers in between. Dijon is well-connected to the highway and is easily accessible from various cities. Take the A6 for Paris which will take you 3-hours or if you’re coming from Lyon, the A31 – A6 which will take 2 and a half hours. Casual wine bar with an extensive wine list coupled with small eats. With portions being a shareable size, try a variety of dishes! Wanting to retain freedom to experiment with cooking, David Zuddas returned his Michelin star. With a menu that changes every 2 weeks. expect innovative dishes. Traditional French restaurant located in the centre of Dijon. With a children’s menu, this is a restaurant for everyone to enjoy! Stay in a historical monument with modern amenities! Located conviently near the old town, attractions and monuments are a short walk away. Situated in the city centre and near the train station, this boutique hotel is easily accessible. It also has a Michelin restaurant within its walls. Featuring an indoor pool and a private garden, it’s perfect for rest and recreation. With its central location, your sightseeing plans will go smoothly! Sip on the finest and sample up to 12 wines as you explore two Burgundy wineries with a guide on this 3-hour wine tour. You’ll also visit the charming Burgundy village of Gevrey-Chambertin. The Opera hall’s acoustics are among the most beautiful in Europe which attracts international orchestras and conductors from all over. With a packed event calendar and children’s workshops, there’s something for everybody at the Opera. There’s more to Dijon than its mustard as you’ll find out on this 2-hour walking tour that will tantalise your tastebuds and take you around Les Halles food market. You’ll also enjoy the traditional Kir aperitif that originated in Dijon.